Welcome to another Feminist Friday column – the Thanksgiving edition. This is the time of year that, for many, it is seen as a celebration, a time to gather with family or loved ones and feast on a meal fit for kings. But it’s also the time of year that brings a lot of pain for Native Americans, as their history and stories have largely been white-washed through text books and social and cultural movements that seek to emphasize the colonialist view of this holiday. So this year, we decided that we want to use our time of gratitude to honor the voices of Indigenous people who are speaking out and sharing the real meaning behind Thanksgiving, and what it personally means to them. We feel as a platform that is dedicated to intersectional feminism, it is our responsibility to share important information in the hope we can enlighten and empower each other with knowledge, in order to be better allies. 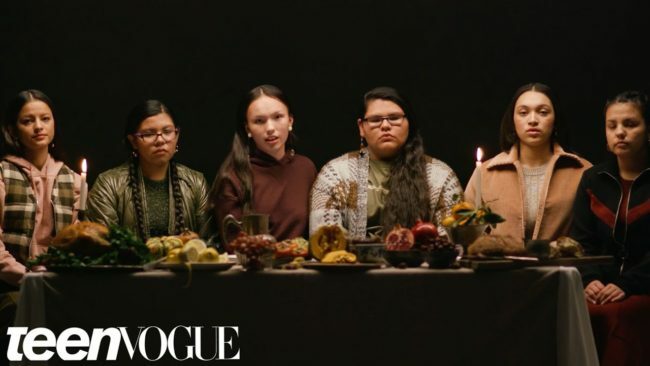 The first video this week comes from Teen Vogue which was originally published in 2016, but is still relevant and we love that it is being told by young Native women. Hear about the real history of Thanksgiving which is not being taught in schools across America. The women who come from different tribes tell how foreigners came to the country, and after killing Natives and invading their village, they would gather around a “thanksgiving” feast, which didn’t officially become a holiday until after Abraham Lincoln became president. The second video was made by The Cut, and asks various Native Americans their thoughts on Thanksgiving. In one word, they describe how the holiday has essentially become co-opted as a day for celebration, but for the Indigenous populations it is the opposite. “Lies”, “sadness”, “inaccurate” as just a few of the sentiments shared, but among the pain there are still shared experiences of family and love that bring them together. One woman says they spend the day re-telling stories about their tribe and their culture in order to keep their history alive. The final video is not an easy one to stomach, but it is relevant and important in the conversation around erasure of Native people and their history. Throughout the United States and Canada, there have been ongoing reports of missing and murdered Indigenous women that has received only meager attention from governments. As NPR reports, Native women are being murdered up to 10 more than the national average, yet many police departments around the country have little to no way of finding out why or tracking the numbers. The Atlantic recently released a short documentary centered around one woman who is fighting to raise awareness about these murdered women and make sure they are documented.